If you happened to catch the opening ceremony for the 2014 Sochi Winter Olympics, you were met with pageantry, fireworks and plenty of excitement for the upcoming games. 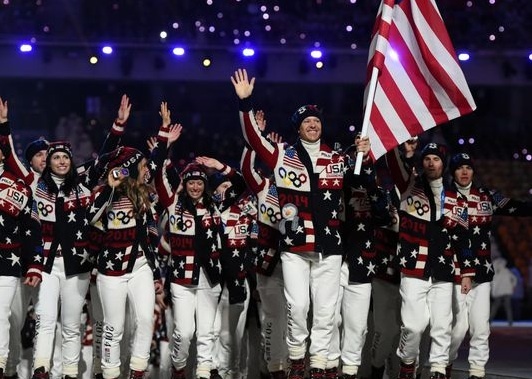 You may have also noticed that the outerwear worn by Team USA was eye-catching, to say the least. The colorful, patchwork cardigans were reminiscent of a winning entry in an ugly Christmas sweater contest or a homemade gift from Grandma. 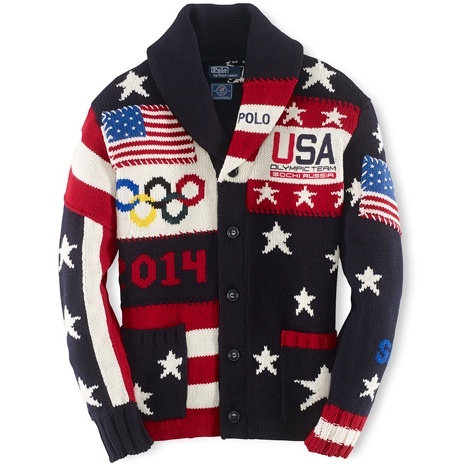 The bold cardigans were neither of those things, and instead a patriotic creation from designer, Ralph Lauren. Despite a largely critical response, collectors have spoken with their wallets and the limited edition gear quickly sold out at Ralph Lauren and is now commanding insane prices on the secondary market. While they exude patriotism, the limited edition sweater jackets were heavily panned when the design was revealed leading up to the games. In addition to the loud design, the retail price tag of $595 appeared steep for the designer wool cardigans. However, $595 seems downright reasonable now. Dozens have already sold on eBay and while the early prices for the red, white, and blue jackets exceeded $1,000, current bidding is pushing the individual cardigan prices closer to $2,500 and higher. Adding to the appeal and boosting resale value, the cardigans are hand-numbered to 324. There is also a matching pair of simple white fleece pants, seen in the image below, which are much more low-key than the elaborate cardigans. The pants retail for $195 and are sold out, as well. The sweaters were produced for Ralph Lauren by Ball of Cotton, a high-end knitwear company owned by Elizabeth and Eddy Park. The company is located in Commerce, California, and each of the hand-sewn cardigans reportedly takes over 12 hours to complete. SOCHI 2014 WINTER OLYMPICS GLASS CUP MUG.FIGURE SKATING ICE DANCING.RARE.RUSSIA.